Smirnoff believes that fun times are even better when everyone’s included, and you don’t need an exclusive guest list or fancy charcuterie plate to turn up the fun! That’s why the brand is launching Smirnoff Party Pitch to celebrate the upcoming return of the summer fan favorite, Smirnoff Red, White & Berry. Smirnoff has enlisted the help of a panel of awesome party people, including LGBTQ reality star and dancing queen, Alyssa Edwards, comedian, actress and life of the party, Nicole Byer, reality television star, real estate mogul and party-thrower extraordinaire, Ryan Serhant and YouTube star, choreographer and party-host-turned-panel-host, Megan Batoon, Smirnoff hopes to find the most exciting, outrageous, silly and wild ideas to celebrate America where fun is the limit – all with responsible drinking in mind, of course. So, how does Smirnoff Party Pitch work? 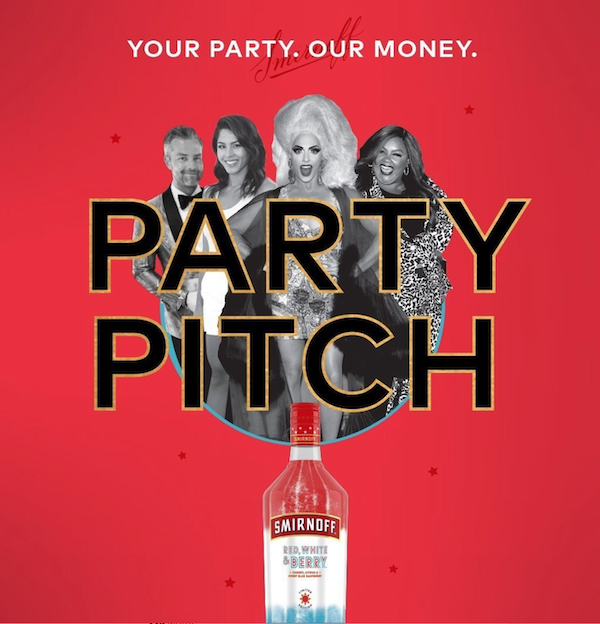 From now through March 27, party people across America (25 and older) can submit their party pitches at www.smirnoff.com/contest/party-pitch. As part of the entry submission, each contestant will need to share how they’d serve SmirnoffRed, White & Berry at their party. Whether it’s red, white and boozy ice pops, gelatin shots or patriotic cocktails, out-of-the-box thinking is encouraged, and the possibilities are sure to be endless! Smirnoff will then review all the exciting entries and choose finalists who will get the chance to pitch their patriotic part in a video to our expert party panel. In true Smirnoff fashion, fun times are better when more people are included so in addition to the one grand prize winner, three runner-up contestants will also receive $2,500 and some swag to fund their own Fourth of July bashes. Smirnoff Party Pitch is the latest extension of Smirnoff’s “Welcome to the Fun%” campaign and is telling the world that you don’t need to be on the VIP list to have a good time by asking consumers to bring the most creative party concepts that bring everyone together. Print article This entry was posted by Art Eddy III on March 19, 2019 at 6:57 am, and is filed under Lifestyle. Follow any responses to this post through RSS 2.0. Both comments and pings are currently closed.